A day trip to Palma, visit the Cathedral La Seu, Palace of Almundaina, La Lonja, Arab Baths and the famous Churches all in one day! If you travel to Palma you must visit the La Seu Cathedral. Palma's most distinctive landmark with amazing architiecture (Gothic). Interior hall was designed by Gaudi and has to be seen to be appreciated. This Cathedral is central in Palma, beside the Paseo Maritimo (promenade). After the visit you can enjoy a stroll through the City. The historic building of La Lonja is found to the west of La Seu (looking at the Cathedral from the sea), and can be seen from the Paseo Maritimo. At present this building is used for art exhibits. La Lonja is a beautiful masterpiece of gothic architecture. Two beautiful churches in Palma, located close to each other just to the east of La Seu (looking at the Cathedral from the sea near to Plaza Major), Santa Eulalia Mallorca's oldest church and Sant Francesc, a truly beautiful church, well worth a visit. The Plaza de Cort, a beautiful 17th century building is beside the churches (town hall). The Arab Baths are found in the quaint narrow streets. You will find plenty of signs. 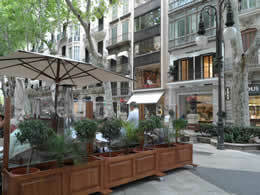 Paseo de Borne is one of the busiest ancient streets in Palma, a tree lined promenade with stone Sphinxes at either end. 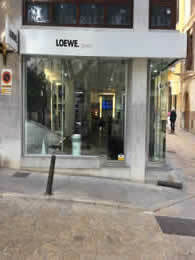 (near to Plaza de Reina) There is a Tourist Information Centre here. You will also find a huge variety of bars and restaurants in this area, you will be spoiled for choice!